The storks are a small family of large waders found locally in the tropics. Some are strongly associated with swamps but others inhabit extensive grasslands. They are often iconic birds, and nearly synonymous with their habitat. One of those associations is the Pantanal — a huge wetland in south-central South America—and the Jabiru (left & below). Jabirus build huge isolated nests well protected by surrounding swamps (left). Pairs form life-long bonds and often reuse the huge nest annually. The extremely heavy bill is used to catch a wide variety of prey — fish (eels predominate in the wet season), frogs, snakes, young caimans — but this adult (below) was hunting bottom-dwelling lungfish and catfish during the dry season in the Brazilian Pantanal. At 8 kg (=18 lbs) it is by far the largest stork in the New World. The stork family has something of a 'beauty and the beast' personality. Some are colorful and elegant — like Saddle-billed Stork of Africa (above) — and can be considered "the beauty." Our exotic Saddle-bill has caught a frog, catching the attention of three Hamerkop Scopus umbretta and a Rufous-bellied Heron Ardeola rufiventris fishing in the same Tanzanian stream. 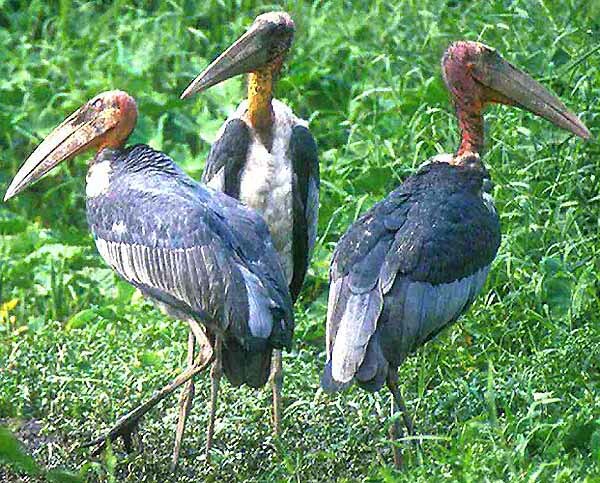 Others are huge scavengers — like Greater Adjutant of south Asia (right) — with a face that might recall "a beast." Greater Adjutant, alas, is now listed as endangered due to the loss of extensive wetlands in Asia, reducing breeding colonies to few and far between. The African equivalent is Marabou Stork, which also has a face that "only a mother could love." As scavengers they consume dead and dying critters and fish, and just about anything else they can catch. Yet they are astonishingly graceful in flight, and can look quite lovely in a late afternoon rain on a palm-frond roost on Lake Victoria (below). Finding a place to nest is critical to stork survival. Loss of wetlands and disturbance at its breeding grounds has contributed to severe declines in Milky Stork (above, in a marsh with Great & Little Egrets), now listed as endangered. Some storks are colonial breeders, like these Painted Storks (left) in India. These colonies are the backbone of the nesting waterbird avifauna at the famed Bharatpur reserve in north India. In wet years huge numbers will breed but in drought the isolated patches of trees they use are accessible to predators. This, and the comparative lack of food in the reduced ponds, limit breeding success. They have, however, adapted well to people. Indeed, there is even an active breeding colony of wild birds in the New Delhi Zoo. Systematically, Elliott (1992) divides the storks into three tribes. There are the "giant storks" [Leptoptilini], highlighted above, including Jabiru, Adjutants, Marabou, Saddle-billed Stork, and Black-necked Stork Ephippiorhychus asiaticus. The four species of Mycteria — including Painted Stork, Milky Stork, and Wood Stork of the New World (in flight, first photo below) — and the two species of open-billed stork — are in "wood stork" group [Mycteriini]. The African Openbill (second photo below) has a gap in the center of the bill even when it is closed. All these storks nest colonially. The seven species of Ciconia are the "typical storks" [Ciconiini]. Three species breed in the temperate zone and then migrate to the tropics in winter. Among them are Black Stork (left) and White Stork (below). The latter ten were resting on an Israeli dike while heading south in fall migration. White Storks are fabled for nesting on roofs in Europe and as the 'stork that brings the baby.' The legend about White Storks bringing babies arose in northern Germany. To quote Elliott (1992): "It is interesting to note that storks start to arrive there about nine months after midsummer, which could mean that the legend goes right back into pagan times. It is certainly true that, until this century with its problems of overcrowding, most civilizations were very keen to have as high a birth-rate as possible, in order to have greater manpower for work and for fighting wars. The association of storks and babies was undoubtedly highly propitious for the bird, as people encouraged the birds to nest on their roofs, in the belief that they would bring fertility and prosperity to the house." Today we may not be looking at storks to "bring fertility and prosperity," but they are still impressive birds. Watching a swathe of Yellow-billed Storks and African Spoonbills (right) harvest fish in the African rift valley lakes by herding them toward shore is, indeed, an impressive sight. Recent DNA analysis has shown that the storks are a well-defined, monophyletic group, but their relationships to other waterbird groups is just now getting sorted out. Sibley & Monroe (1990) had thought that New World vultures might be related to storks, but newer biochemical evidence shows clearly that "New World vultures and storks are distantly removed for one another" (Cracraft et al. 2004). More recently, storks have been placed in their own Order Ciconiiformes, now separated from Order Pelecaniformes by Order Suliformes (Hackett et al. 2008). In other words, storks are an entirely unique, and not closely related to any other wading birds. Photos: The Jabiru Jabiru mycteria nest and the open-billed adult were in the Brazilian Pantanal in July 2010. The Saddle-billed Stork Ephippiorhychus senegalensis, with attendants, was in Tarangire Nat'l Park, Tanzania, on 6 Aug 2002. The Greater Adjutants Leptoptilos dubius were at a rubbish tip in Guwati, Assam, India, on 30 Mar 2001. The Marabou Stork Leptoptilos crumeniferus was at on Lake Victoria, Uganda, in Aug 2020. The Milky Stork Mycteria cinerea, and egrets, were a marsh near the airport in Jakarta, Java, Indonesia, in Aug 1988. 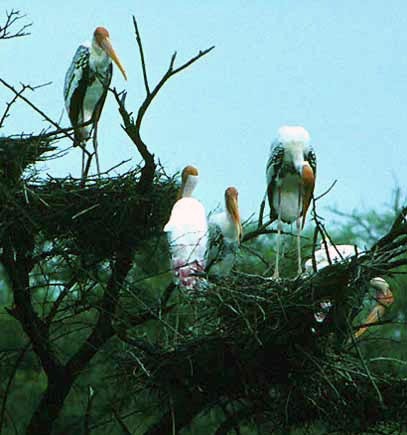 The colony of Painted Stork Mycteria leucocephala was at Bharatpur, Rajasthan, India, in Aug 1978. The flying Wood Stork Mycteria americana was in the Brazilian Pantanal on 21 July 2010. The African Open-billed Stork Anastomus oscitans was along the Grumeti River, Serengeti Nat'l Park, Tanzania, on 13 Aug 2002. 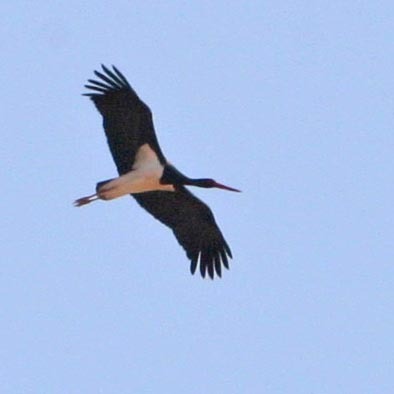 The Black Stork Ciconia nigra was circling near Brandvlei, South Africa, on 8 July 2005. The group of ten White Stork Ciconia ciconia was at the Huleh Reserve, Israel, on 26 Oct 1981. The Yellow-billed Storks Mycteria ibis (with African Spoonbills Platalea alba) were at Lake Nakuru, Kenya, in Nov 1983. All photos © Don Roberson; all rights reserved. Bibliographic note: There is no family book per se although storks are included in numerous texts which cover storks among large waders (e.g., herons, ibises). The account by Elliott (1996) in the Handbook of the Birds of the World series is a nice introduction, with many fine photos. Cracraft, J., F.K. Barker, M. Braun, J. Harshman, G.J. Dyke, J. Feinstein, S. Stanley, A. Cibois, P. Schikler, P. Beresford, J. García-Moreno, M.D. Sorenson, T. Yuri and D.P. Mindell. 2004. Phylogenetic relationships among modern birds (Neornithes): toward an avian tree of life. Pp. 468-489 in Assembling the Tree of Life (J. Cracraft and M. J. Donoghue, eds.). Oxford Univ. Press, New York. Elliott, A. 1992. 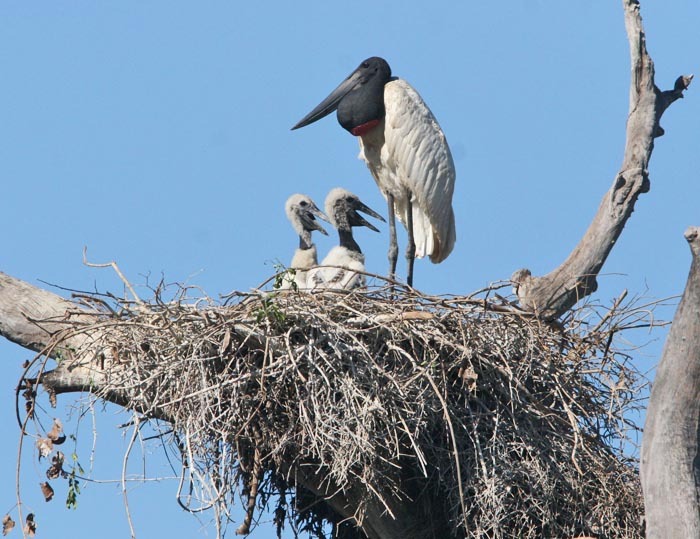 Family Ciconiidae (Storks). Pp. 436-465 in del Hoyo, J., Elliott, A., & Sargatal, J., eds. Handbook of the Birds of the World. Vol. 1. Lynx Edicions, Barcelona. Hackett, S.J., R.T. Kimball, S. Reddy, R.C.K. Bowie, E.L. Braun, M.J. Braun, J.L. Chojnowski, W.A. Cox, K. Han, J. Harshman, C.J. Huddleston, B.D. Marks, K.J. Miglia, W.S. Moore, F.H. Sheldon, D.W. Steadman, C.C. Witt, and T. Yuri. 2008. A phylogenomic study of birds reveals their evolutionary history. Science 320: 1760–1768. Sibley, C.G., and B. L. Monroe, Jr. 1990. Distribution and Taxonomy of the Birds of the World. Yale Univ. Press, New Haven, CT.